While the rafting season technically stretches from May to September, the “high water” season when many of the rivers are at their peak from mountain runoff starts in May, and goes into June. 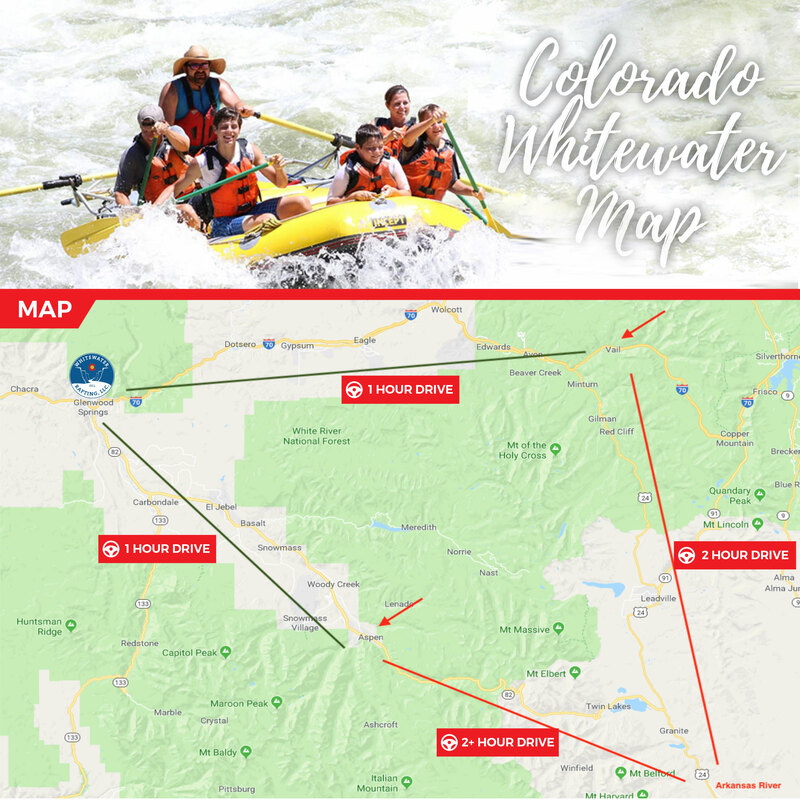 While there are plenty of streams and rivers around Aspen to explore, The Colorado River is the most consistent choice for those who want a thrilling and unforgettable whitewater river rafting experience. The class III “Shoshone” section of the Colorado River takes riders on a nine-mile journey through the gorgeous Glenwood Canyon. Starting out fast-paced and mellowing out towards the end, this trip offers spectacular views of the canyon walls, as well as scenic wildlife and mountain vistas. Take an exhilarating journey on the Shoshone with Colorado Whitewater Rafting’s Half-Day and Full-Day trips, which all begin at the company’s location in Glenwood Springs. During the early and late season, half-day trips begin at 10am and 1:30pm and are 3 hours long. Full-day trips give riders even more of a chance to enjoy the Shoshone, as they cover twice as much mileage as the half-day trips. Trips begin at 9am, are 6-7 hours long, and cover 14-25 miles depending on the conditions. Be aware that during the spring this section of the river is considered class IV, and is class III in the summer and fall. In addition to the mighty Colorado River, there are other local rivers in Aspen including the Roaring Fork, a tributary of the Colorado River that offers both scenic and challenging rides for rafters with varying experience levels. The lower section of the Roaring Fork offers class II and class III rapids that provide stunning views of Mt. Sopris, as well as the chance to see plenty of wildlife and geology. Here, rafters will pass through the moderately paced Cemetery rapids which are comprised of a handful of small rapids and a larger one that flows through Glenwood Springs. The upper section of the Roaring Fork includes the Woody Creek & Toothache rapids that provide a great combination of mild floating as well as continuous semi-technical rapids. Lastly rafters can pass through the challenging class IV “Slaughterhouse” section of the Roaring Fork, which offers some of the most technical rafting in all of Colorado. In other words – not for beginners! If you are willing to venture just a stretch away from Aspen, the Arkansas River offers some of North America’s most popular rapids with more than 100 miles of whitewater total. The river flows past some of Colorado’s biggest and most beautiful mountains and offers class III and class IV rapids with spectacular views. While there, bee sure to check out Browns Canyon, which is considered one of Colorado’s most popular rafting trips as is provides the perfect mix of rapids for beginners and experienced rafters alike.